Although certain mushrooms have been used since pre-history, the ability to identify beneficial properties and then extract the active ingredient started with the discovery of penicillin by Alexander Fleming in 1928. The fungus with probably the longest record of use, Ganoderma lucidum (Red Reishi), is known in Chinese as líng zhī ("spirit plant"), and in Japanese as mannentake ("10,000 year mushroom"). In ancient Japan, Grifola frondosa (Maitake) was worth its weight in silver. Inonotus obliquus (Chaga) was used in Russia as early as the 16th century. One of the biggest controversies in the mushroom extract industry today is the use of mycelium grown on grain. Mycelium is to a mushroom like what roots are to a tree. When grown properly, they will form whole fruiting bodies; which are called mushrooms. However, to save money, most US producers of mushroom products today grow the mycelium on a bed of grain, like rice. To speed up production, and to make the end product cheaper to produce, these manufacturers grind up the mycelium and grain together, before allowing them to form whole fruiting bodies. 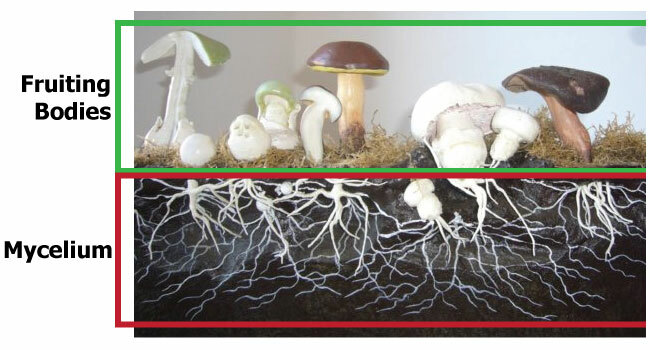 The issue with that is that mycelium is not a mushroom, just like the roots of a tree are not a tree. 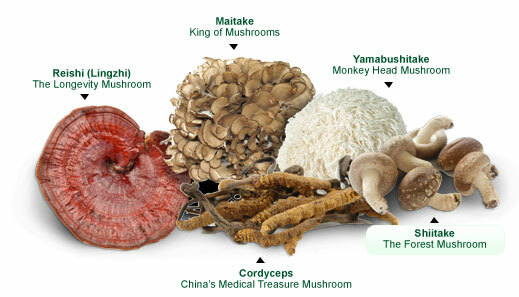 The beneficial compounds in these mushroom species are all studied with relation to their fruiting bodies. The FDA even states that mycelium is not allowed to be called "mushrooms." However, many of the biggest brands today thwart that FDA guideline, and put out a cheaply-made, mislabeled, and ultimately ineffective products. They hide this fact by standardizing to "polysaccharides" instead of "β-Glucans." Well guess what shows up as polysaccharides in the traditional testing? Carbohydrates! Yes, the very carbohydrates from the rice used to grow the mycelium is used as a measure of the active ingredient in these substandard products. When you are buying one of the major mushroom products on store shelves today, you are buying a bunch of ground up rice mixed in with mycelium! Even though the label may say “mushroom”, you need to look at the Supplement Facts panel. For example, does it say Reishi mushroom? Reishi mushroom mycelium? Or Reishi mycelium? Some products will list the latin name, Ganoderma lucidum, without mentioning mushroom or mycelium. Honest companies will reveal if the product is mycelium. They will also state in the “Other Ingredients” that there is grain or myceliated grain. Note that it is a requirement for herbal products to state “plant part” and also whether there are other unrelated materials present. Many companies selling mycelium products will have the word “mushroom” everywhere. In their literature, label, website. Seeing the word mushroom so many times can obscure the actual product, low potency mycelium. Mycelium on grain is actually nothing more than what commercial mushroom growers call “grain spawn”. Grain spawn is cheap to produce and is therefore economical to grow in North America. Unfortunately, mycelium grown on grain or rice contains minimal amounts of the important compounds that are in mushroom extracts. Myceliated grain is cheap to produce, often cheap to purchase, but the lack of beneficial compounds makes it a very expensive product. Some of the most expensive "mushroom" products on store shelves today are some of the lest effective, and mostly ground up grains. Nammex has pioneered the development and manufacture of mushroom extracts for the nutritional supplement industry since 1989. Because they focus entirely on mushrooms, they have been able to identify the active compounds in the various species, with an aggressive program of research and development. They are expert mycologists who have a passion for mushrooms, and how to improve them; just like we are passionate about advancing Nootropics. When we made the decision to start offering mushroom extracts, we wanted to ensure that we had the best. Partnering with Nammex to ensure that was a no brainer. Now that we have worked with Nammex, and had many long conversations about the state of the industry, the mycology behind their cultivation, and the chemistry behind their mechanisms, we too are now passionate about getting that message out there. Nammex offers Certified Organic whole fruiting body mushroom extracts, which have been grown on the proper substrate for the species of mushroom used. The mushrooms are put through a special hot water extraction, to break down the chitin in the cell walls of the mushroom. Humans do not have the enzyme needed to break down chitin in vivo. This is why you cannot get all the beneficial compounds when eating fresh whole mushrooms. Here is where Nammex really differs, though. After the hot water extraction, they dehydrate the whole mushroom material and mix it with the extract, to create a truly full spectrum bioavailable extract. You do not lose any compounds in the extraction process, since the entire mushroom material is kept. Their full spectrum 1:1 extracts have higher beta-glucan amounts than even much more concentrated extracts. It's exactly how the mushrooms are found in nature, but made bioavailable for humans. Nammex personally inspects the farms growing the raw mushrooms, to ensure everything is perfect. They also run Megazyme testing for beta-glucans and low starch, HPLC for triterpenoids, mass spec for heavy metals, and microbiological testing for bacteria. On top of that, in preparation for the launch of the mushroom line on Nootropics Depot, Nammex ran a ton of extra testing to ensure there were no pesticide residues on the extracts. These in-depth tests are beyond what any other supplier of mushroom extracts on the market has done. They truly are the world class partner we were looking for in the mushroom industry!